Vincenzo Agnetti, La macchina drogata (The Drugged Machine), 1968, altered Olivetti calculator, dimensions variable. London has been reevaluating what it knows about the Italian neo-avant-garde of late: Exhibitions of Claudio Parmiggiani, Irma Blank, Emilio Isgró, and Vincenzo Agnetti at this space have revealed the depth of postwar Italian art histories. Agnetti had a significant role alongside Piero Manzoni and Enrico Castellani in the early life of the journal and gallery Azimut/h. In his writings, Agnetti searched for new languages of expression, favoring work in novel materials and with a relationship to language, philosophy, and information. Agnetti demonstrates how his own work echoed this experimentation. 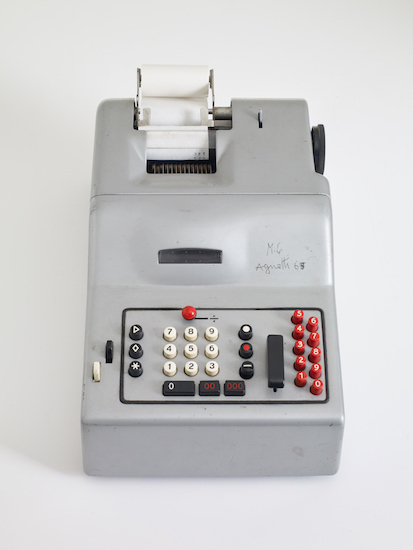 Focusing on language and its productive arbitrariness and doubt, a highlight is La macchina drogata (The Drugged Machine), 1968, a reconfigured Olivetti calculator that replaces the machine’s inked numbers with letters from a typewriter. Pressing the numbered keys results in fragmented nonsense that undoes the fixity of writing, making poetry on a scroll intended for accounting. Produced at the time of student occupations, the work’s provocation to the language of bureaucracy is incisive, disarming. The series “Feltri” (Felts), 1970–81, presents further explorations of memory and forgetting in short, aphoristic forms. One example, Paesaggio (Landscape), 1971, is engraved with a single painted word, “TERRITORY,” linking title to text in a gesture that unsettles the relationship between national identity and possession. “Assiomi” (Axioms), 1968–77, by contrast, combines statements with charts and diagrammatic drawings. Here, a work titled Assioma - Il valore culturale di un'opera è direttamente proporzionale alla necessità che suscita in noi (Axiom - The cultural value of an artwork is directly proportional to the need it arouses in us), 1971, draws connections to intangible value while perversely showing an attempt to measure it. This is part of Agnetti’s mission: to exploit the black holes between signifier and signified, using language to open to thoughts, questioning value and knowledge.